Remember slumber party ghost stories? The old, urban legend kind that scared everyone for about a minute, then you'd laugh and fill your mouth with another handful of M&M's and let it go...until someone had to pee and now suddenly all twelve of you were crammed in a tiny bathroom? Return of the Friday Plot Swap: How's Your Heart Ticking? Before life slapped me around last year, the Friday Plot Swap was my favorite weekly post. Thanks to the magic of Facebook's "On This Day" feature, I've been reminded how much I fun I had with these. And then, some great plots fell in my lap. So this is what I have for you this week. That was one of my mom's favorite sayings. I thought it was appropriate for the two plot bunnies I found this week. What could you make out of these? Have you seen any stories that would make good plots lately? (Click on the titles to see the full stories). I left my heart in...Ohio? A coroner says a heart found in a plastic bag on the ground next to an Ohio gas station appears to be human. This was the one that sucked me back in. It screamed, "How can you read this and NOT have a Friday Plot Swap?" It was right. There is just so much to work with here. Serial killer leaving clues. Bitter ex-girlfriend of lab research assistant trying to sabotage him. What really cracked me up was the comments on the article. One person stated, "It would be easy to mis-identify a heart from a chimp or monkey for a human one..." Well, that clears everything up! Because it's totally commonplace to find a chimp's heart in a Ziploc at a gas station in Ohio. I will admit that I've never been to Ohio so I am in no position to offer an opinion on what may or may not be found in their gas station parking lots. Speaking of hearts, if this video doesn't make yours just swell right out of your chest, you should make an appointment with a cardiologist, maybe a therapist as well. The expressions on these kids' faces say it all and the way he hugs her. It's like his whole world just became right again. Can you imagine the story possibilities here? These two reuniting as college students? Or the long, twisted path that brings them back to the same airport as adults? Or even just a sweet picture book about the hardship of leaving your friends. *Sniff* I'm not crying. Onions. I bought too many onions. So, that's what I have for you today. Got any cute plot bunnies or even scary plot bunnies with fangs trying to lead you astray? This has been Spring Break week for me! My family and I have done virtually nothing. It has been AMAZING! For our plot swap, I thought I'd offer up some great Spring Break ideas. What could you do with these? The family that plays together stays together. I'm not sure which is worse. The fact they brought kids along or the fact they were caught because an off-duty police officer was having lunch across the street and thought the woman sprinting back to her car after going in the bank looked suspicious. So, romantic suspense: They were robbing the bank to protect their children from a nefarious villain. Romantic comedy: The sister of the woman must match wits with the off-duty police officer to prove she isn't guilty. This had to be a terrifying experiences. But, my favorite part is that his friend didn't see him get swallowed by the earth. When he vanished from sight they assumed he'd fallen down a hill, but didn't go looking for him until they heard moaning! Horror: The friends never find him and he must claw his way out before the demon beast at the bottom of the hole claws him. Time travel: Of course, the sinkhole is a portal to another dimension where he arrives and must solve five tasks (it was a par 5 hole) before returning. Did you know there is a book titled "The Thrill of the Chase" in which the author outlines clues to a $2 Million dollar treasure he supposedly hid in the mountains near Santa Fe? Well, this woman did. She went looking for it and got lost. She was later found safe. What could drive her to risk everything to go hiking alone searching for this treasure? What if she'd found it? What kind of personal growth did she experience while on the chase? Got any good plots going? Intentions of committing a felony? I have an eclectic set of plot starters for you this week. Let's start with the cave! This would make a great middle-grade plot. A"How I spent my summer vacation" type story. Or, a Dawn-would-never-read-this-because-she's-a-big-fat-chicken, horror story about the evil that would certainly lurk in such a place. Creepy. No other word for it. But, oh the possibilities. The article says a woman in a long skirt has been seen leaving the packages. Who is she? Why would she be doing this? Who are the gifts meant for? What kind of twists could you make out of that? Add your story to our mix. It's been a while since we've done a Text From Last Night swap. What situation could you set up for your MC that would lead to these texts? a pizza costume came into my possession last night. needless to say i showed up to his house wearing only the pizza, shouting "delivery" into his window. Went outside and he was playing rock paper scissors with a cop over a drunk in public ticket. Swap with me! Got any good plot-ready texts lately? I went to a workshop once where the presenter compared loglines to the little blurbs you see on your TV guide. Last year, as an experiment I scrolled through my guide for some plot ideas. I decided to give it another try with some different movies this year. Click on the logline to go to the movie description. What kind of fun could you have with these? College students play a treasure-hunting game that contains a deadly mystery. Asthe threat of cancellation looms, a TV talk show host pulls an outrageous stuntin an attempt to boost his ratings. The plan of three women to intercept a drug shipment for their boss goes horribly wrong. Books are always better than the movie. Could you make these into something awesome? Leave a logline and we'll try to guess the book or movie. Have a plot? Leave one. Need a plot ? Take one. The man decided he wanted to make his home under the boulder when he was 8 years old. He saved his money, bought the land and has lived there with his wife for 30 years, raising seven children. What would their life be like? What if one of their children was accepted into a prestigious school and left home? What kind of culture shock would he/she experience? A Harvard professor says that by injecting Stone Age genes into a human embryo — and then implanting the embryo into a human surrogate mother — it will soon be possible to create a living Neanderthal. In the past few days, the scientist has come out saying he isn't actively searching for a woman for this experiment. But, the science fiction implications of that kind of procedure are endless. What if the baby disproved everything we know about primitive man? What if the woman was meant only to be a surrogate and give up the baby to some scientific organization, but decides she can't. Then, takes the baby and runs? This is my favorite this week. Scotch, bottled in 1898 and left behind during a failed expedition in 1907 was found perfectly preserved in frozen crates during 2010. After extracting a sample to be used to recreate the formula, the bottles are being returned to where they were found as a tribute to the explorers. The story of the expedition. The story of the team recreating the formula. What if someone wanted to steal it? The story of the team returning the bottles. So many different plots! LOVE IT! Read any good plots lately? Have any abandoned plots you want to drop off for adoption? Have I got a story for you this week! Can it be a coincidence both of the stories came out within days of each other? Germany is transferring nearly 700 tons of gold bars worth $36 billion from Paris and New York to its vaults in Frankfurt. That could be an awesome story alone. Think of all the people who have to be planning and scheming how to steal even just a little of this money right now! But, then you have to read this! German police say robbers dug a 30-meter (100-foot) tunnel into the safe deposit room of a Berlin bank and escaped with their haul, setting a fire as they left to cover their tracks. You know who is plotting to steal it? The reluctant thief who is only involved because he/she plans to use the loot to do something noble. The daughter of a former thief who wants to pull of a heist to shed doubt on her father's conviction. ooh, even better, the daughter of an former thief who infiltrates her father's old crew to pull off the heist and leave them hanging just like they did her dad. The police officer who just knows the tunnel robbers are going to make a move on the gold and wants to be ready for them. Friday Plot Swap~People are crazy. First, a little music to inspire you today. Let's start with Mars, shall we? Mars One, a Dutch-based non-profit seeking to send people to Mars, has put up an advertisement seeking applications from interested parties. A total of 30 astronauts will eventually live on Mars, according to the plan, sent in teams of four making the journey every two years from 2023. Definitely want to read the fine print on this one! One note of caution: The trip is one-way, and if everything goes to plan, you will grow old and die on Mars. So many places this story could go! Then, we can move on to stupid crazy. This guy's escape and crime spree could be a novel in itself. Guess he thought so, too. He wrote out every detail and sent it to a (hopefully, former) girlfriend. My favorite part is that at the very end of the letter, he asks her to send him $100. Run, sweetie. Run now! This just screams "creepy, stalker suspense!" What if the girl didn't even know him? Or if he is a long ago ex-boyfriend? Or, if all of it was a distraction so a different crime could happen? We'll end our swapping journey with just crazy, crazy. The headline is slightly misleading. The man was already handcuffed and in the back of a cruiser when they brought a drug dog to search his car. Clearly, the man responded in the best manner possible barking and growling at the dog. I'm sure the officers loved that! What kind of craziness is going on in your plot? I knew I was going to use this first one the moment I saw it. A Navy officer has been relieved of his duties as commander of a submarine following the discovery that he faked his own death in order to end an extramarital affair. This screams mystery to me. Who is the woman? Why did the man feel the need to be "dead" to be away from her? The woman found out when she went to his former house. Can you imagine that conversation? Maybe he needs to take a hint from this guy? First of all, Dude, WHAT DID YOU DO?!?! 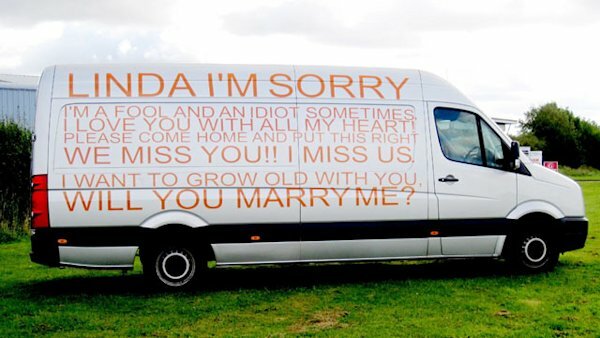 Second, what makes you think "Linda" is going to see your random van? Lastly, how is she supposed to respond? Throw herself on the hood? I could see this working for a sweet, light romance or a creepy, stalker thriller. Woman Finds Ex-Boyfriend Living In Her Attic. Oh, the places you could go with this one. The article has details about how he was living up there and the fact he was staring at her through the ceiling vents. So, Swap with me!!! What could make of these? Heard any other good plots lately? Return of the Friday Plot Swap! I have missed swapping with you. Have I got some stories for you this week! This woman would make an awesome character! Her fiance is a pirate. Does it get any better than that? For the full effect, you really need to check out the video. This is for my Historical writing friends, but the story kind of fascinated me. The plan is to have actors playing Lincoln and her son, but real judges acting as lawyers and trying the case according today's laws. Imagine the story of preparing for that, especially if it happened to parallel what was happening in the person's life at that time...or if the lawyer happen to fall for the actor!